Welcome Mexican wolf M1019, Wild Bill! While this is not his official name (it was his nickname at his previous home) it may stay with him. M1019 was born “Blue Free” (the designation in the Mexican Wolf Studbook for wolves born in the wild in the designated recovery area) in April 2005. He was born into the Hon-dah Pack, whose territory was on the FAIR (Fort Apache Indian Reservation) belonging to the White Mountain Apache Tribe. They’ve been cooperators on the recovery of the Mexican wolf for many years. By April 2006, however, USFWS issued a removal order for the entire Hon-dah pack due to 6 or more depredations made the previous year. Depredations are generally a livestock death or injury which is confirmed to have been caused by wolves. M1019 was a year old at the time he was captured and removed from the wild. 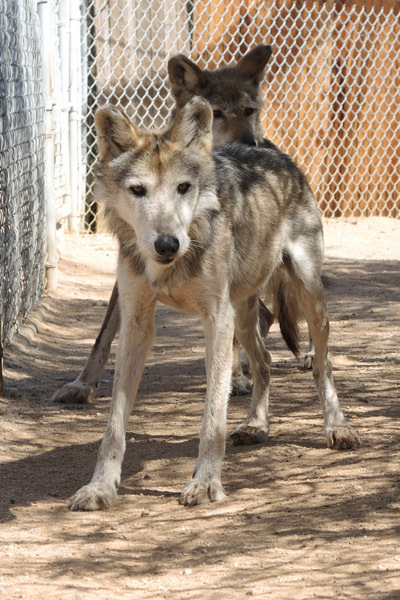 He lived at the Ladder Ranch and Sevilleta Wolf Management Facilities in New Mexico through 2010, before being transferred to the Endangered Wolf Center in 2011. It was there that he was paired with a female wolf, F886 Corazon. They moved together to the Oklahoma City Zoological Park in 2015. Southwest Wildlife is happy to welcome M1019 and Corazon to our facility. We’re still getting to know them, but, they’re adjusting well to their new home. Wild Bill is especially curious and busy staking a claim to his new territory here at the sanctuary.